Last week a tragic, senseless, murderous crime was committed in a Charleston, SC church. Believers were gathered for Bible study and prayer when nine were gunned down and killed. How do we even begin to process such a crime? As Christians our first response, after perhaps a few, “Why Lord, why?” should be to bow our heads and allow deep sorrow to call to deep grace. 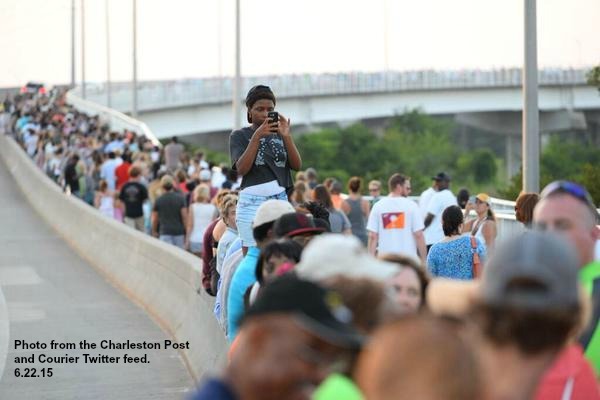 Yesterday, more than 10,000 people walked across the Ravenel Bridge in Charleston to show their solidarity and support for the Mother Emanuel Church – the photos and story are stunning. You can read about it here. Peace, joy, love. That’s what I felt downtown Charleston this evening in front of Emmanuel AME Church. God blessed me by allowing me to pray with 3 beautiful women who lost a grandma & two mothers. Thank u, Ladies & thank u, Father. God bless them all abundantly!! I believe with all my heart the nine people slain last week will be counted as martyrs for their faith and commitment to the Lord Jesus Christ, as they should be. What did we do yesterday for the three thousand plus babies who were aborted in America? (Statistics here.) Or, the 125,000 aborted worldwide, in just ONE DAY alone? Sin, ALL sin, grieves the heart of God. It is the root and fruit of evil. I know beyond a shadow of doubt God would have us get involved. If you write? Then write. If you march? Then march. If you pray? Then pray. If you peacefully protest? Then protest. If you write letters to the editor? Then send. If you give and donate? Then give and donate. If you go? Then go. There is something for every someone – let us RISE UP and SHOW UP and be instruments of God’s love, grace, and mercy. So glad to be neighbors at #TellHisStory this week Susan. This is a powerful post to rise up and use what He’s given us to speak up, thank you! Katie, love to have visitors!! Thank you. Yes, Susan, there is something we all can do. I wrote similarly to that theme. Together, each of us doing our part, we will make a difference. I agree with you that something we all can do is pray and love. I’m your neighbor at the #RaRaLinkup! Going to read your post in a few minutes…I corrected the name !!! Thank you for being brave (as always) and hitting this head-on! I have to admit, in our house we do not watch the news (too many questions to answer from my kids). But I’ve been following the news. It’s hard to make sense of this, isn’t it? Those that can and will stand-up have the firm foundation to take that risk in these times. Standing with you Charleston! Thank you Susan for this post! We all need to rise up and take a stand, while we still have opportunities to do so. Christina, you are so right “while we still have opportunity to do so.” Thank you for visiting. Such very true words. Religious persecution, slave trafficking, and abortion, all are things we don’t necessarily see, but we know for sure are out there and need to be exposed and fought against. It’s our job. Our right, and our responsibility. We can each contribute! Thanks, Susan. That’s exactly right, Ruthie. Abortion happens every single day – thousands of lives are murdered and yet there seems to be such a complacency. Why? Because they’re “just babies?” I don’t know, it gets me riled up. I love that photo of the bridge. Amen, Lord! May we continue to rise up to fight injustice in other places as well. Lisa, yes. We must be a voice for the unheard. Beth, thank you and so many blessings back to you. Melissa, I value your words because I know you are careful with them and don’t throw them around carelessly – thank you. I’m so glad you linked to that article/site – I hadn’t seen that yet and that bridge – I love that bridge… and to see it filled for the sake of love and unity… even more so now! K – I’m going to Charleston in a couple of weeks so I’ll be on that bridge for the first time! Oh my, this breaks my heart. My soul aches over this situation. Thank you for speaking such peaceful words. Cheering you on from the #RaRalinkup with Purposeful Faith. Kelly, glad you found peace in my words and I appreciate the visit! Beautiful, powerful words, Susan! I love the sentence, “As Christians our first response, after perhaps a few, “Why Lord, why?” should be to bow our heads and allow deep sorrow to call to deep grace.” YES!!! Blessings to you today! I love Joyce Meyer’s saying, “Do we run to the phone or run to The Throne!” Thank you Lisa for visiting. The bridge – the actual structure – seems symbolic to me, like the peace and forgiveness present are bridging a gap between the world and God. That’s what hit when I read your post. Thanks for encouraging us all to rise up. I’m glad you linked up this post at #ThreeWordWednesday. I can’t “amen” this enough. Your words are spot-on. Thank you. Thank you, Marie. Hope you are feeling better! Thanks also for visiting my blog. Summer, thanks for the return visit! Remember? What a glorious few days that was.